The Los Angeles Times has debuted a new show on Charter’s Spectrum News 1 SoCol that features a simple and light look with nods to the newspapers heritage as a print publication. As part of the new show, the Times built a new studio in the building it moved to last summer, after selling longtime home in 2014. It had been leasing the building back until a new headquarters could be found and renovated. The show, which airs Monday through Thursdays at 7 and 10 p.m. featuring Spectrum anchor Lisa McRee, a former “Good Morning America” anchor, interviewing L.A. Times reporters and columnists, runs for an hour exclusively on Charter cable. The show will include both news and lifestyle content from the L.A. Times newsroom — including looks at food, entertainment, movies and more. 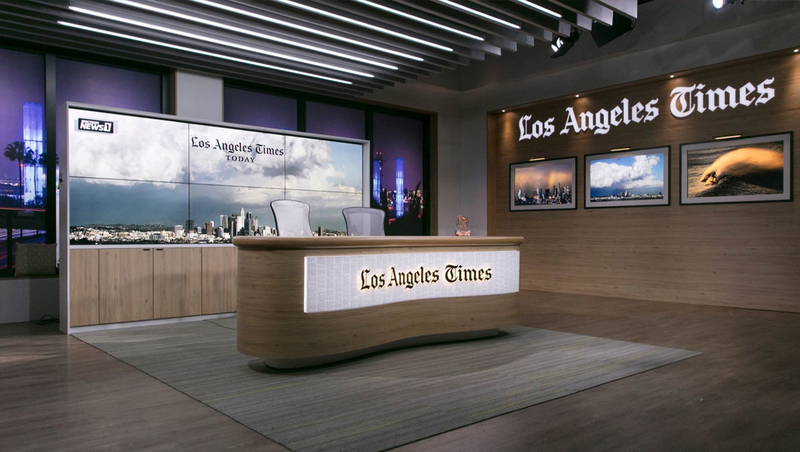 A bright studio space resplendent with the classic blackletter Los Angeles Times flag in backlit dimensional lettering, soft woods, horizontal lighted ceiling lighting and backdrop of the L.A. skyline with video wall in front. Jeff Hall’s JHD Group created the design with fabrication by Scenic Express, technology by Background Images and lighting form Redwood Media Group. A curved, slightly kidney-bean shaped anchor desk is front with a white panel that features newspaper-style “microtext” behind the newspaper logo. 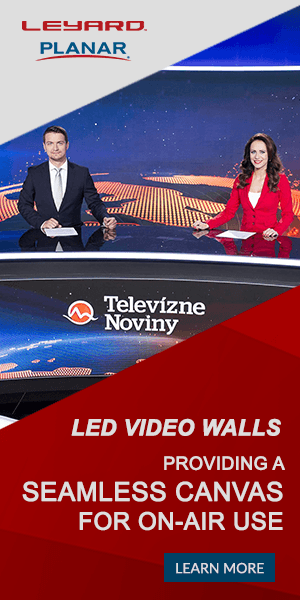 Behind the desk is a 3×2 video wall built into a credenza-style unit and wrapped in a thin light border that gives the show the flexibility to change backdrops as needed. Along one wall are three horizontal flat panels built into the wall to create the illusion of “picture frames,” complete with a downlight, that can be used to showcase L.A. Times photojournalists’ work or other imagery. The flexible design of the studio also makes it flexible enough to use for other productions or for media inserts of L.A. Times reporters appearing on other media outlets.